Make us dream with all your oldhammer stuff! One of my favourite armies in the Warhammer Armies book has always been the Bretonnian army of Dave Andrews. Most of the models depicted were no longer available by the time I got into warhammer, but I loved the look of the army. I never thought I would eventually be able to collect them. I've always felt the whole Lady of the Lake mythology with noble knights looking for the Grail was a bit silly. To me, Bretonnia is a dangerous, dirt-poor country with a wealthy elite that doesn't care. I've tried taking a few pictures but most didn't come out very well. The two I have aren't really representative of the colours, but at least they're not blurry. I'll have to experiment with lighting. First up is a unit of Villains (town militia) led by a Baron (level 5 hero). The complete unit is made up of 30 men at arms, but I'm in the process of rebasing and these are the only ones that are showable. The unit is a mixture of Citadel and Foundry models. The only way to tell the two apart is by turning them over and see whether they have a tab in the slotta base. A unit of Noblesse D'épée, the lowliest Bretonnian knights (being only +1 shock elite). A Bretonnian army never takes the field without at least one unit of these. I absolutely love the individuality of the knights. They ooze character. The lances of the two knights with pendants are actually from the current bretonnian range. At the moment I'm updating my Rascals (peasants). They are arguably the most important part of the old school Bretonnian army. Completely useless in battle, but really, no self-respecting Bretonnian knight would take the field without pushing some reluctant peasants in front of him. Very nice pics and miniatures... Dave Andrews army is a model for a bretonian collector... 3rd ed Siege rule book present fanstatic pics of his huge collection. Very nice. Love the paint job. Can't wait to see the rascals as well as the rest of your army. Yeah...those look like they stepped right of the pages of the armies book...though with better paint jobs. Are those knights foundry as well? 3rd Edition will rise AGAIN!!!! Are those knights foundry as well? The knights are also Foundry. The original Citadel ones don't turn up very often on eBay, and if they do, they tend to be expensive. I'm not sure when the knights disappeared from the range, but Halberdiers and crossbowmen remained a part for longer, and they're easier to find. Very nice, my understanding is that the old foundry/citadel ranges are available once more, on request, so your collecting may get a little easier and hopefully cheaper. You'll also get a bunch of copy cats, I have a few of the men at arms but not an armies worth. 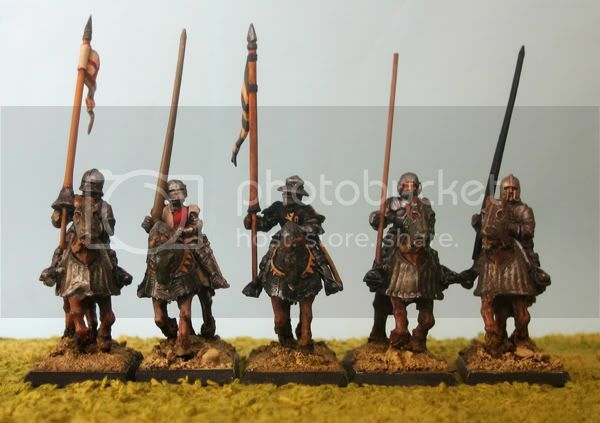 Great minis and paintjobs and good news - I need some of those mounted knights! Thanks for the comments, all. At the moment I have plenty of the knights. 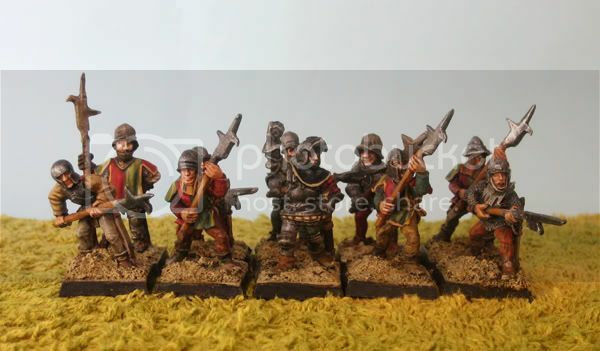 I could do with some spearmen to field as Ribalds, though. I remember they were in the Foundry range about a year ago. I think I'll drop them a mail when the rest of the army is finished. My Rascals are coming along nicely, by the way. I should be able to take some new pics this weekend. There should be some of them here and there. And the full set is available as a collection too. Nice and gritty! Looking very good, sir.